LOL!!! I have had so many laughs this weekend with family and friends as we celebrated my brother's 40th birthday. We had an amazing weekend full of fun and laughter and memories that will last forever. 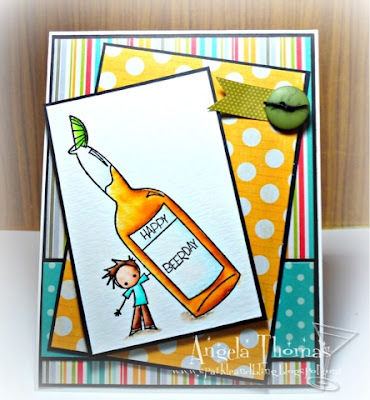 I made this card for my brother's birthday using the Stamping Bella image called "Beer Peep". I wanted something that would be lively and fun just like my old brother... Oops... did I mention her turned 40? We've been bugging him about it all weekend because he's the oldest out of all the family in terms of cousins etc. The DP is a mixture of Pebbles and Crate Paper. The image has been watercolored with Tombow markers. I'll be back more throughout the week. Have a great day!!! This is a really cute card and it definitely tickled my funnybone. I'm sure your brother loved it.